In terms of fitness, I'm loving a more laid back approach to running and a heavier focus on yoga, strength and overall fitness, rather than cramming in tons of running for marathon training. It's rather refreshing. It's also given me some time to reflect on what I loved using during marathon training and some of my newest or all time favorites. 1. ProCompression. These socks are nothing short of amazing. I blog about them all of the time. I am constantly wearing ProCompression socks because they just feel absolutely amazing. 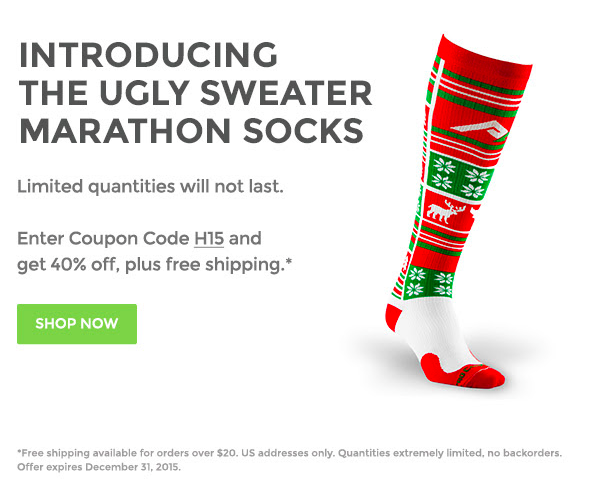 Yesterday, ProCompression released their December sock - the Ugly Sweater Sock. Instantly I knew I needed it. I ordered it without even thinking. Thank goodness I did because they are sold out. Fingers crossed they arrive shortly so I can wear them every single day until Christmas. If you don't have ProCompression in your life. You need to! Check out their website and sign up the monthly email. You'll get a Sock of The Month email each month with a sweet discount. 3. SaltStick. The more I run, the more I figure out how electrolytes affect my performance. I hydrate all of the time, but it's not enough. I tried the SaltStick capsules earlier this year and I loved them. I just didn't like swallowing a pill while running. I did it, because the outcome was favorable. But it wasn't fun. SaltStick sent me their newest product --- FASTCHEWS. Oh my. Amazing. They provide you with the same results, but dissolve so much easier. Yep! Fun Fact: For those of you who live in the U.S., you can purchase Fastchews directly from SaltStick's online store. Check it out at shopsaltstick.com! When I was running the Gore-Tex Philadelphia Marathon, I tucked a few of these into my handheld. I felt some cramping coming non and took one. Instant relief. Note, I tried them while marathon training as well. Never, ever try something new marathon day! *Giveaway begins today, 12/4/15 and ends 12/12/15. disclaimer: I was sent SaltStick product to review. I was not required to write a positive review. As always, all opinions expressed on my blog are 100% my own.